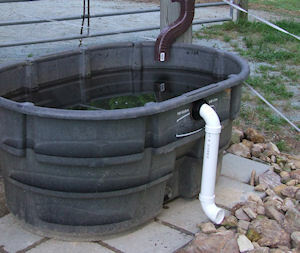 Figure 1: An inexpensive rain storage container, made from a 150 gallon Rubbermaid trough and fed from a downspout. The PVC overflow line attaches through the wall of the trough with a rubber-gasketed shower drain (available at any hardware store). Pile rocks below this line's outlet to prevent erosion. Two of these rain troughs hold 300 gallons – enough to water a few horses in an emergency for a week or more. They fill in minutes in any good rain, and later rains keep them fresh. To keep leaves, insects, and sunlight out, cover with any suitable lid, such as one cut from exterior grade plywood. If breeding mosquitos are a concern, add just one or two drops of mineral oil after each good rain.